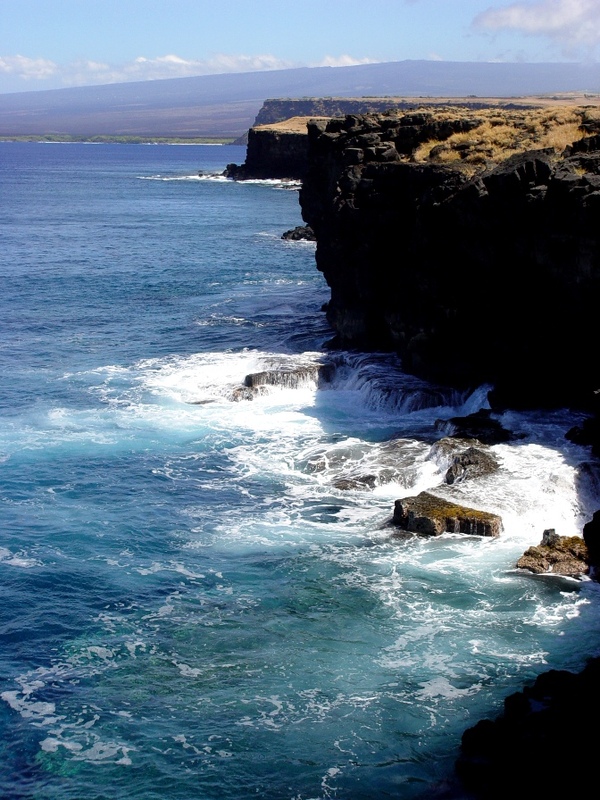 Geotripper: The Hawai'i That Was: How Can the Biggest Mountain in the World Stay So Hidden? The Hawai'i That Was: How Can the Biggest Mountain in the World Stay So Hidden? The answer is easy: clouds. This whole post is a temper tantrum, a tantrum that resulted from the fact that we were on the Big Island of Hawai'i, the site of the biggest mountain on planet Earth, for nine days a few weeks ago. Despite repeated opportunities, my students never had a clear view of Mauna Loa, the volcano that covers more than half of the island. It was a rainy stretch of weather, so the best we ever got were brief peeks, kind of like watching an old-fashioned feather boa dance. 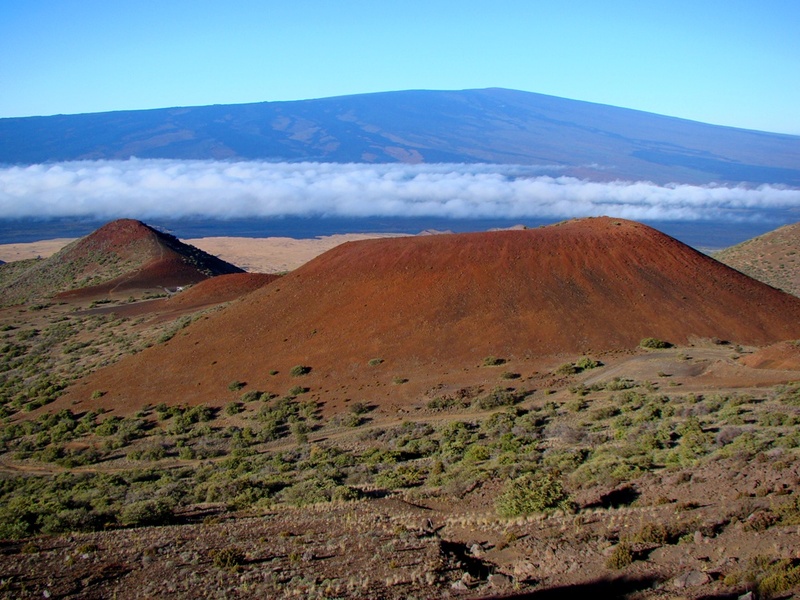 So in response, I've drawn from the Geotripper archives to find pictures of Mauna Loa from earlier trips. Very sunny trips. Clouds are not the least bit unusual on the slopes of Mauna Loa and Mauna Kea, the two highest peaks on the planet (as measured from the sea floor; of the two, Mauna Kea is slightly higher). The Hawaiian Islands lie in the path of the trade winds most of the year, and as the moist air masses rise against the gentle slopes of the massive shields, they cool and condense into clouds. Hilo is pretty much the wettest city in the United States, with more than 100 inches of rain each year. 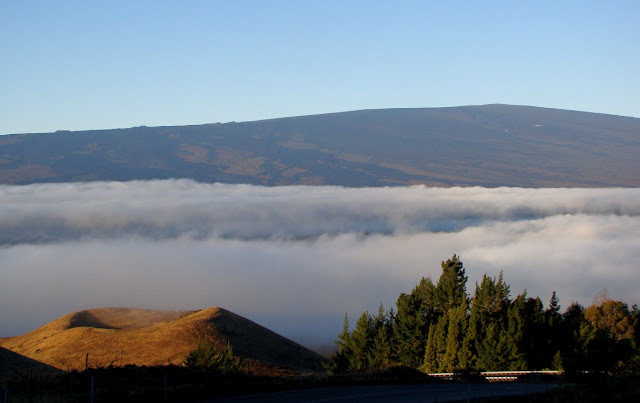 Oddly enough, an atmospheric inversion layer limits cloud formation to the lower slopes of the volcanoes. It's been more than once that I've left Hilo in a rainstorm only to find crystal clear skies up on the mountain (but not so much last week!). Exceptions, like earlier this month, happen when storm fronts come through. In winter, snow is not a rare occurrence on the high peaks. 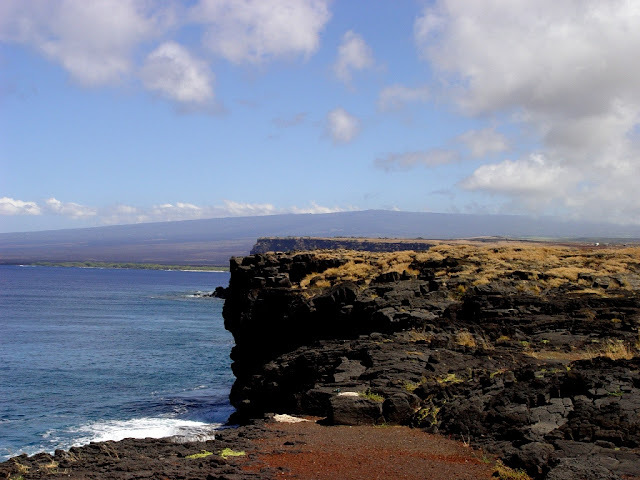 Oceans have a lot to do with the fact that no one gets to see the entirety of Mauna Loa. It is the biggest mountain on the planet, as well as the biggest volcano (although the Tamu Massif may be more voluminous), but it rises of the floor of the Pacific Ocean, with around 17,000 feet hidden beneath sea level. A bit less than 14,000 feet rises above the waves. It depresses the sea floor another five miles, so the mountain could actually be said to be 56,000 feet high. It has a volume of 15,000-19,000 cubic miles. Sunset on Mauna Loa from Mauna Kea. The brown air is vog from the eruptions at Kilauea on the other side of the mountain. The volcano began erupting perhaps 700,000 years ago, and became an island around 400,000 years ago. It's hard to confirm since the older lava flows are hidden deep beneath the younger ones. The oldest exposed lavas (at the Ninole Hills) are about 200,000 years old. The giant shield continues to be very active, with 33 eruptions since 1843. 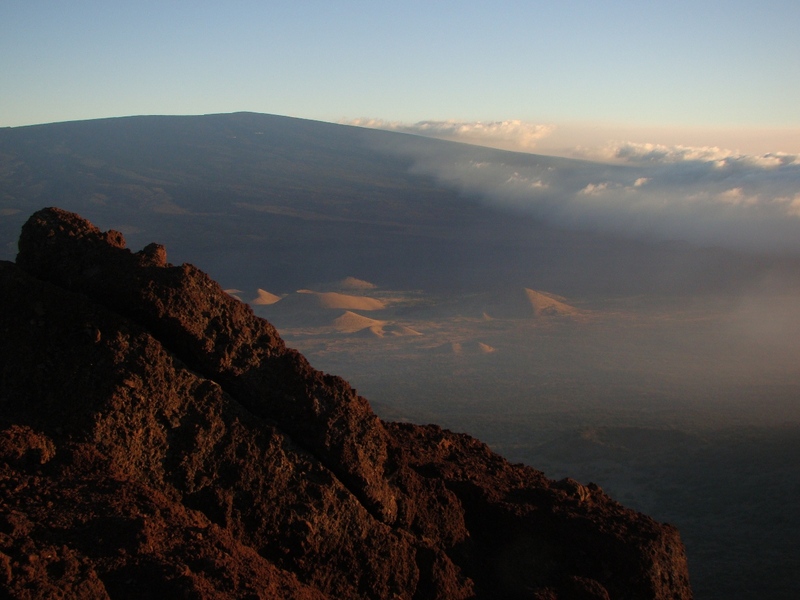 The last eruption was in 1984, making this quiescent period the longest in recorded history (contrast that with the continuous eruptions at nearby Kilauea that started in 1983). The lava from the 1984 eruption came uncomfortably close to Hilo. Mauna Loa from South Point, the imaginatively named southernmost point in the United States. The gentle slopes of the volcano belie the true immensity of the mountain. To hike from the shoreline to summit is to simulate a trip from the tropics to the Arctic Circle. The slopes above 4,000 feet are among the most important bird habitat in the nation. Hawai'i is a gigantic open laboratory of evolution and the many native species have been decimated by environmental disruptions caused by the arrival of humans and their pigs, goats, rats, and mongooses. Even worse was the arrival of mosquitoes in the 1870s, as they are a vector for transmitting avian malaria. The native birds had no immunity. The mosquitoes can't thrive in the cooler conditions above 4,000 feet, so the mountains are an island within an island, providing sanctuary for the remaining survivors. 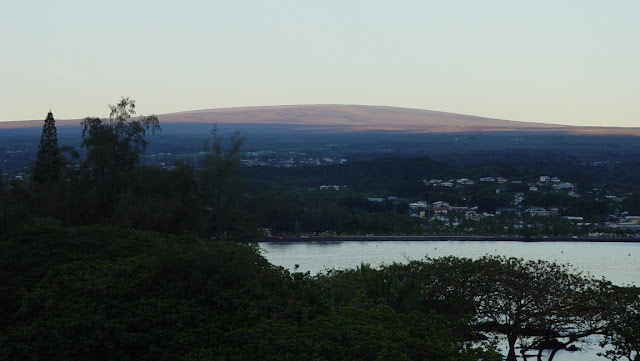 Mauna Loa looks almost insignificant in the morning light from Hilo Bay (below), but the summit is around forty miles away. The mountain is gigantic, and dangerous. And we barely got to see it earlier this month. But we knew it was there. We were surrounded by its flows in Hilo, at Hawai'i Volcanoes National Park, at South Point, and at Kona, a drive that took us 120 miles!